International Arts Festival and Contest will be held in Baku. 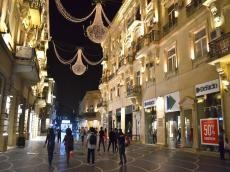 The third Testene Art Baku Festival will be held on March 13-17, Trend Life reported. The event organizers include the Ministry of Culture, Baku Central Cultural Department, Testene Art Association (Italy), music school No. 3 named after Jovdad Hajiyev. The competition will be held in the following nominations: vocal, instrumental performance, dance, theater, folklore, decorative arts, folk musical instruments, as well as fashion and design. The festival will feature contests in several nominations and age groups: 4-8 years, 9-12 years, 13-16 years, 17-19 years, 20 years and older. Master classes for piano and violin, as well as visual arts will be held. The jury will include cultural and art workers from Russia, Kazakhstan, Lithuania, Israel and Italy. Winner of the Grand Prix for vocalists will be presented a special song composed by the People's Artist of Russia Viktor Pelenyagre. Testene Art Baku Festival, held for the first time in 2016, brining together a great number of participants from different countries. The performance of young performers from Azerbaijan caused the jury's interest. After winning the Grand Prix, Nijat Pelengov (balaban) successfully represented Azerbaijan at the contest in Italy.